It may be surprising, but I think that Coming to America may be having its greatest period of influence ever on African entertainment, 26 years after its release in 1988. On Nollywood, in particular. The movie, one of my personal favourite comedies, follows the story of Akeem, crown prince of the fictional African Kingdom of Zamunda, who comes to America to find a bride. 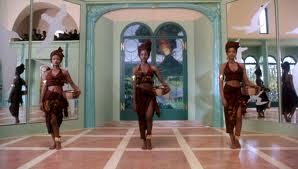 It was Eddie Murphy at the height of his powers. Anyway, a couple of weeks ago, I had to take an ABC Coach to go to Cotonou to see a man about a thing. A fairly short distance but thumbs up to the Federal Road Safety Commission and the Customs and Immigration Services with their 10 checkpoints each between LASU and the border, and then at the border itself, for tacking on an extra few hours. ABC filled the intervening journey time with their “in-flight” Nollywood entertainment. Apart from seeing previews with Funke Akindele basically reprising her Jenifa character in a variety of non-Jenifa-franchise movies clearly aimed at boosting her crossover appeal (our very own Steven Seagal, if you like), there were loads of “Igwe” films. Kings and crown princes from various miniature kingdoms, purportedly in southeastern Nigeria, living in varying degrees of mostly anachronistic opulence. It wasn’t out of place, for instance, to see a prince or princess, who lived in a palace with marble floors and modern furniture, go for walks in the forest barefooted. Or for neighbouring kingdoms, whose Igwes both drive 2003+ Mercedes Benzes to gather up their “soldiers”, dress them in animal-skin loin-cloth, arm them with spears and shields and then “go to war”. 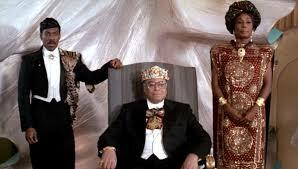 More than anachronisms however, were the unmistakable influences from King Jaffe Joffa of Zamunda, with servants in uniform, kings and princes with lionskin/lionhead sashes, right down to even the caps that Akeem and Semi wore. Then, there was the movie where three princesses tried to outdo each other to be chosen by the crown prince of some other kingdom, at the banquet put on by their father (more Disney Princess than Akeem, I’ll admit) and another where the monarch had people throwing flower petals on the ground for him to walk on. I’m probably not in Nollywood’s target demographic but I couldn’t help thinking about the differences between Zamunda and the “kingdoms” in the Igwe movies. Zamunda was a country, so Jaffe’s wealth was more understandable and more likely than the usually unexplained wealth of the movie Igwe. Also, from my understanding of traditional monarchies in Nigeria, succession to the throne is not hereditary, at least not in the sense of passing from Father to Son to Grandson. It more often than not is determined by a council of kingmakers and, as such, crown princes are an unlikely notion. I may be wrong about this however. I think, more than the inconsistencies, which will surely be eliminated over time, it is truly remarkable, in 2014, to still see shades of Akeem and his father in the carriage and costume of the Nollywood kings and princes. Tribute to an enduring piece of movie magic. Ha ha ha, @It wasn’t out of place, for instance, to see a prince or princess, who lived in a palace with marble floors and modern furniture, go for walks in the forest barefooted. Who knows? Maybe they wanted forest leaves to massage the balls of their feet! Nollywood is evolving, up is the only place to go now.